In the world of auto-tune, lip-synching and the gambit of other “live performance enhancers,” it is a rare hear/see a band just lay themselves out there; but the is exactly what Stryper does on their “Live at the Whiskey” release. 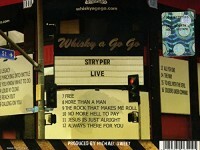 Live at the Whiskey is the latest release by Stryper and includes a DVD and CD of their November 16th, 2014 concert at the Whiskey A Go Go in West Hollywood. On this live album, the yellow and black stripes are subdued and the big hair has disappeared. Fortunately, for the members of the band the long hair remains. Instead of power ballads, you get 16 tracks of rock-n-roll. The audio quality of the album is impressive, especially for a live album. While you can hear the audience, it never overpowers the any of the music. Nor do you get the feeling you are listening to the album in the echoing noise bleed seats. Instead, you hear each instrument and vocalist clearly and distinctly as if you are near the band. If you compare the first two tracks of the live album (“Legacy” and “Marching Into Battle”) album with the studio album “No More Hell to Pay”, to the untrained ear like mine, they are nearly identical instrumentally. The vocals are rawer and more organic, giving the live album an edgier sound. The DVD that comes with the CD uses shot from multiple angles and cuts from musician often, so you get to see the entire band up close. Sometimes I felt like it was too often, but at the same time it very different from having just one camera panning the performance. The DVD captures what appears to be the entire performance, so you get extras like the band praying with the audience. The video is DVD quality, so do not expect full HD. The video does not come with the digital copy. If I were to point out any flaws in the album, the few I found were minor. The opening to the DVD looks amateurish. It may have the 80’s feel but I expect something better given the standards of today. The audio where the audience sings along are weak. This might have something to do with the acoustics of the venue. While this is clearly a loud rock-n-roll album, it might have been nice to have a few acoustic pieces. The band is just as amazing unplugged as well. Next Next post: Nerd Men Rejoice !